Empire of Books: Doc Mortis Tour: My Biggest Fear By Barry Hutchison and Doc Mortis Review! Doc Mortis Tour: My Biggest Fear By Barry Hutchison and Doc Mortis Review! When I was a kid, I was scared of most things. Dogs. Cats. Birds. Goldfish. Confined spaces. Wide open spaces. You name it, I was scared of it. Now that I’m older, I’m happy to report that I’ve managed to conquer most of the irrational fears I had during childhood. When I was seven-years-old I found a squirrel lying on a path in a park. It was a dead squirrel. I knew it was dead because of the way it was slumped on the concrete. And because its intestines had exploded out through its eyes. Something had happened to that squirrel. Something terrible. My first thought was “aww, that’s a shame”, and for most people that would be the end of it. They’d step past the tangled mess of fur and innards and carry on with their day. Not me, though. Not seven-year-old me. The problem I had, and the reason I was so afraid of so many things, was that I had a very overactive imagination. Whenever I heard a noise from somewhere in my house, it wasn’t the wind, it was a murderer, intent on killing my family. When friends tried to get me to climb fences I refused because, I believed, I would fall and shatter my spine. Or tear a leg off. Or somehow lose an eye. And when I looked down at the gooey remains of that squirrel, I didn’t just think “aww, that’s a shame”, I also thought “WHAT IF IT COMES BACK TO LIFE?!?”. I ran then, my head filled with visions of this… this… zombie squirrel coming back from the dead and hurling itself at my face in a frenzy of teeth and claws and exposed digestive tract. My heart began to race, sweat began pouring from my skin and – yes – I believe I started to cry, so vivid was this image of the undead squirrel attack. Fortunately, squirrels are easy to avoid (dead ones are even easier) and I’ve managed to go through the two and a half decades since then without really encountering too many of them. In case you can’t see the picture, allow me to explain. IT’S A GHOSTLY WHITE SQUIRREL WITH DEMONIC RED EYES! screeching. When I got home, the squirrel was gone, although it reappeared several more times over the next few months, often brandishing a gun*. But my main concern wasn’t the freaky Albino squirrel. 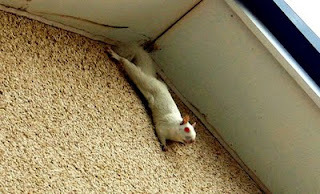 My main concern was how the freaky Albino squirrel ended up at my house. I’ve done research, and there are only an estimated 25 Albino squirrels in the whole of the UK. How many grown men have a squirrel phobia? Probably half that amount, tops. So, I refuse to believe that it’s coincidence that the thing tracked me down. I reckon the other squirrels got together and planned the whole thing. Maybe this one is just painted white with contacts in, I don’t know, but I think there was motive behind it. The squirrels plotted the whole thing, just to wind me up and make it impossible for me to leave the house for the next six months without ducking and covering my head with my hands. Because they do that, squirrels. Official synopsis: "Kyle wakes up in hospital – which is strange, because he doesn't remember being ill. And that's not all. He's also deliriously flitting in and out of the Darkest Corners, and in the shadow version of the hospital the surfaces aren't clean, and the sharp instruments aren't used for healing. It's Kyle's most terrifying experience yet, and it's about to get much, much worse. 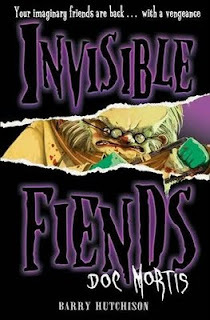 The doctor will see him now…"
Despite owning the first book in the Invisible Fiends series, Mr. Mumbles, I've never gotten around to reading the series for one reason or another and decided not too long ago that I would aim to get all four books that'd be out by the end of this year and read them in one go, if not sooner then over the Christmas break when it'll be pants tv and the hours start to drag as everyone else sleep the days away... but then I got the chance to take part in this blog tour and it just seemed the perfect opportunity to get into the series. I decided that I'd read the book of it's own merit rather than read the first three books first. 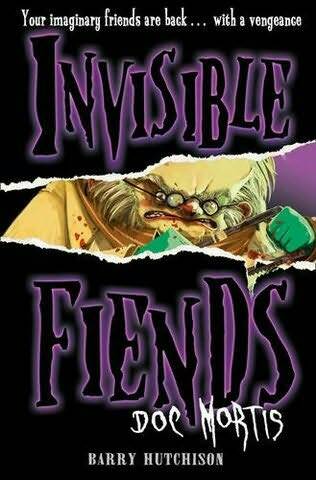 I loved the sound of this one, even more so than the previous novels in the series and the cover is simply amazing and creepy, I just had to. Eventually, I read the book in one sitting on a day off from work. And what a day it was. The feelings I went through when reading this book. Horror, sadness, revulsion, compasion... and there was the odd laugh or two. Barry blends the horror with the humor perfectly. Just when your stomach feels all funny and gurgly with the blood, guts and gore, you have a little chuckle and all is well again, only for that sickening yet addictive feeling to build again. The characters are well rounded and really seem to complement one another. Doc Mortis himself has to be one of the creepiest characters I've ever come across. As someone who actually does have a bit of a fear of doctors and hospitals... anything medical in general this book really touched a nerve. Let's just say that I am put off going to my GP for any ailments at the moment for the very foreseeable future. The fact that one of my doctors actually does look a bit like Doc Mortis, although a thinner version doesn't help. Thanks Barry, thank you very much! I have to say that the book more than surpassed my expectations for the series and I really am looking forward to reading the other books already out and of course continuing with the series. With the publication of The Beast early next year, I better get a move on in anticipation. I'd also really like some kind of TV/movie adaptation for these books. There's a real cinematic feel in your head when reading the book and I'd love to actually see it with my own eyes, rather than my minds eye. But until such an adaption might happen, I will just have to imagine extra hard the gore that is still to come! My thanks to Barry for such a cracking read and for stopping by today, it's been an honour! And to the lovely folk at HarperCollins for my copy of the book!